Pakistan's president has warned the West would be "brought to its knees" without his country's co-operation in the so-called war on terror. "If we were not with you, you won't manage anything," said President Pervez Musharraf in a BBC Radio 4 interview. He said the Taleban, not al-Qaeda, was now the focus of the struggle against militancy in the region. "The greatest danger today is if the Taleban movement gets converted into a people's movement," he warned. In the BBC interview Mr Musharraf rejected these claims and said ISI's support was vital. "You'll be brought down to your knees if Pakistan doesn't co-operate with you. That is all that I would like to say. Pakistan is the main ally. If we were not with you, you won't manage anything," he said. "Let that be clear. And if ISI is not with you, you will fail." He also claims the US and Britain had a historic debt to pay as Pakistan had helped "win the Cold War" for the West. He argued that the West's strategy in Afghanistan towards the end of the Cold War helped to create the conditions which led to al-Qaeda's rise. President Musharraf said mujahideen fighters went into the area from all over the world and the West armed and trained the Taleban. He said Pakistan was then left "high and dry". His comments develop arguments he has made over the past few days at meetings with US President George W Bush and Tony Blair and a speech given in Oxford. Gen Musharraf said the Pakistani government's aim in the country's tribal border areas was to "wean the people away" from supporting the Taleban, pointing out that while al-Qaeda was mainly comprised of "foreigners", the Taleban's support was more locally based. He denied the suggestion that the tribal elders with whom the government has forged a recent agreement are a front for the Taleban. He said the tribal elders were the "only way" to establish support from the local population: "The army cannot get them on our side". Gen Musharraf also strongly denied allegations by the human rights organisation Amnesty International that some alleged terror suspects had vanished without trace. "I don't want even to reply to that, it is a nonsense, I don't believe it, I don't trust it," he said. Gen Musharraf said the authorities had detained some 700 people, but all of them were accounted for. Of the leaked MoD paper, British defence officials claimed it was written by a junior official, was unfinished and had not been seen by anyone who actually makes government policy. 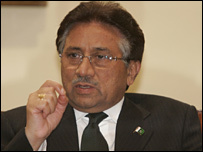 After two hours of talks on Thursday Downing Street said Gen Musharraf had accepted Mr Blair's reassurances.